Confirmation of the previously announced drilling results at Prohibition Zone, Paddy’s Flat, including intersects 7m @ 6.5g/t, 69m @ 3.6g/t, 46m @ 1.9g/t and 28m @ 6.9 g/t all in hole 06PRRD001 representing a modest increase of the previously reported grade. The resource at Bluebird is currently defined as 5,280,000 tonnes @ 1.9 g/t Au for 326,000 ounces. The bulk of these ounces are contained within five high grade domains, 1,698,000 tonnes @ 4.5 g/t Au for 244,000 ounces, surrounded by a lower grade alteration halo. Additional structures being targeted include Edin Hope (to the south west of Bluebird), Polar Star (to the south east of Bluebird) and Bluebird North. 1 m @ 15.7 g/t Au, 8 m @ 11.1 g/t Au, 5 m @ 1.6 g/t Au, 2 m @ 3.9 g/t Au, 4 m @ 2 g/t Au, 3 m @ 4.3 g/t Au, 4 m @ 10.1 g/t Au, 17 m @ 3.1 g/t Au, and 3 m @ 6.90 g/t Au on the Bluebird lodes. 10 m @ 3 g/t Au from the only Bluebird North drill hole result, received thus far. 0.6 m @ 21 g/t Au, and 4m @ 2 g/t Au on the Polar Star zone. 7 m @ 1.6 g/t Au, 2 m @ 2.4 g/t Au, and 7 m @ 1.1 g/t Au on the Edin Hope zone. Of particular significance was the 8 m @ 11.1 g/t Au intersection. This hole was targeting mineralisation immediately north of the Bluebird pit, in the gap between the Bluebird and Bluebird North pit, and supports the extension of the high grade Bluebird domain north of the currently defined resource. 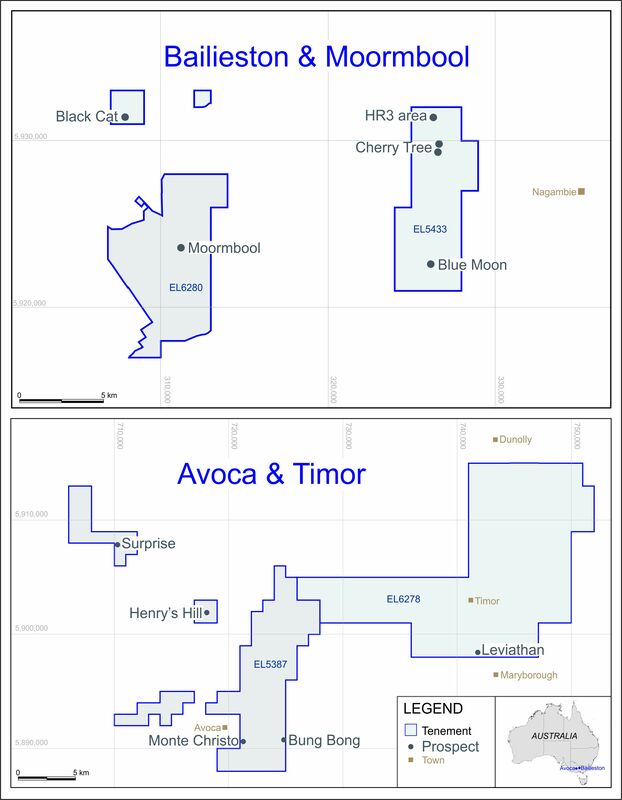 Only one result has been received from the Bluebird North resource drilling, with RC drilling results still outstanding, and diamond drilling still in progress. The Bluebird lodes have generally been the highest grade structures, within close proximity (~1.5 kilometres) of the treatment plant. To take advantage of this strategic location, future mining is expected to be centred on the Bluebird deposit. Sterilisation drilling over the mill, and office area, returned no significant result, and indicate that mill, and powerhouse refurbishment can be carried out, as planned. A more detailed table of drilling results for Bluebird is available on the Company’s website. As announced on 20 April 2006, hole 06PRRD001 is collared in the haul road, 70 metres below surface. The revised results show a modest increase in grade reflecting the use of the more reliable fire assay technique. In addition, these results are complete, whilst the earlier results had a small number of un-reported intervals. Notes on table The drill assay table in this press release is based on geological intervals that are illustrated in a diagram which will be available on the Company’s website. The “from→ to” value is the distance down the hole. The vertical depth is the distance from surface at which the intersect is first recognised (note that the hole was drilled within the pit). The assay method for all samples is Genalysis 50g fire assay (FA50/AAS). Note (1) the interval 69m @ 3.58g/t includes 21m of internal dilution at an average grade of 0.54 g/t, (2) the interval 46m @ 1.96g/t includes 18m of internal dilution at an average grade of 0.55 g/t, (3) the interval 4m @ 4.25g/t includes a high grade zone of 2m @ 7.48 g/t from 319m, and (4) the interval 28m @ 6.96g/t includes a high grade zone of 13m @ 10.26 g/t from 403m. provide data for revised evaluations on the resources at Prohibition and Vivian Consols, and assess the depths to which these deposits may be mined in an enlarged open cut operation. Julian Vearncombe BSc (Hons), PhD, FGS, RPGeo, FAIG is a director of the Company and consents to the inclusion of the information in the form and context in which it appears here. Julian Vearncombe is a Competent Person for the reporting of these results as defined by the JORC Code 2004 Edition.